What is a Romany Vardo? 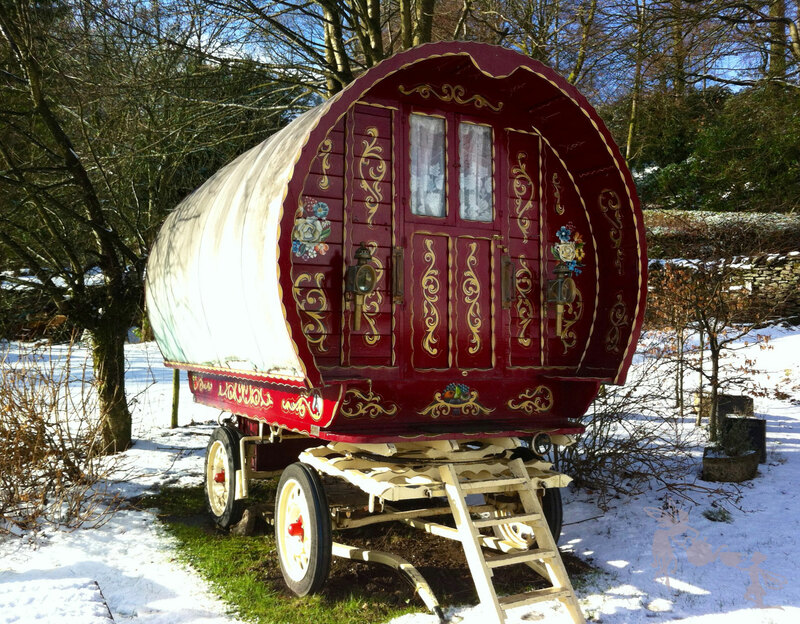 For the uninitiated a vardo is Romani chib for ‘living wagon’ or, in plain English, a Gypsy caravan. There are many variants of vardo design and build going back to the 1850’s. Our vardo is a particularly fine example of a traditionally built and painted ‘Yorkshire Bowtop’, though in truth as many of this type were built in Scotland, Northumberland, Cumberland, Westmoreland and Lancashire. Today there are sadly very few original examples of vardo in existence as wear and tear, the vagaries of the British weather and changes in lifestyle over the years have rendered survivors a relative rarity. Our vardo was built and painted at the turn of the century by a very respected Lancashire based craftsman to the exacting standards of construction dictated by the working plans of past masters. It has graced Fair Hill at the Appleby Horse Fair on more than one occasion. It was also totally renovated by the original craftsman in the spring of 2016 having been inundated by the floodwaters of Storm Desmond on 5 December 2015. Our vardo is still a true ‘living wagon’ as it is actually lived in! As such, it is not available for casual hire as a ‘glamping option’ though we do consider requests for film set work, advertising commissions, modelling assignments and the like. Location scouts and producers please get in touch via the contact page.